The mission of the Lockheed C-130 is to provide rapid transportation of personnel or cargo for delivery by air-drop or by air-land. 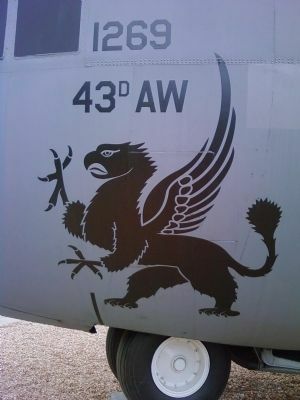 The aircraft can be used as a tactical transport carrying 92 ground troops or 64 paratroopers and equipment. It can be readily converted for ambulance or aerial delivery missions. Location. 35° 10.002′ N, 79° 0.227′ W. Marker is in Fort Bragg, North Carolina, in Cumberland County. Marker is on Reilly Street 0.1 miles south of Bomard Street, on the left when traveling south. Touch for map. 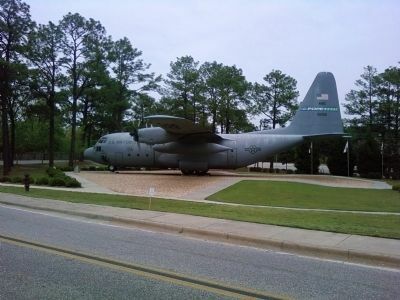 Located in the Pope Air Force Base Air Park. Marker is in this post office area: Pope Army Airfield NC 28308, United States of America. Touch for directions. of this marker); Pope Airmen Memorial (about 300 feet away, measured in a direct line); Airlifter's Memorial (about 300 feet away); C-119 "Packet" (about 300 feet away); Lt. Harley H. Pope (about 400 feet away); Enlisted Personnel Memorial (about 400 feet away); DC-3/C-47 "Skytrain" (about 500 feet away). Touch for a list and map of all markers in Fort Bragg. More. 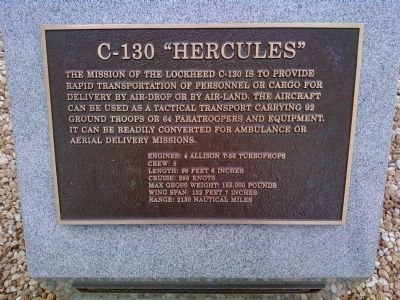 Search the internet for C-130 "Hercules". Credits. This page was last revised on June 16, 2016. 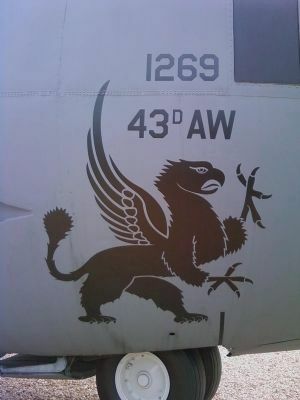 This page originally submitted on July 1, 2011, by Lee Hattabaugh of Capshaw, Alabama. This page has been viewed 706 times since then and 4 times this year. Photos: 1, 2, 3, 4. submitted on July 1, 2011, by Lee Hattabaugh of Capshaw, Alabama. • Bernard Fisher was the editor who published this page.